Grover Cheek was great. He spent a lot of time with us before and after we purchased the Highlander making sure we understood the many features.. We love our new vehicle. Everything went smooth. Marvin was very helpful and easy to deal with and I got a nice car. Grover was awesome in helping us get a great deal on our 2019 Toyota Tundra. Grover is very knowledgeable in sharing the information thoroughly about Toyota vehicles. We are repeat customers here because of our experience with Grover. We highly recommend going to see Grover if you are interested in purchasing a Toyota vehicle. Grover was extremely knowledgeable and helpful. His recommendationto use supplier discount was a deal sealer. He went out of his way tospend time explaining all the new details and technology of my new Avalon. 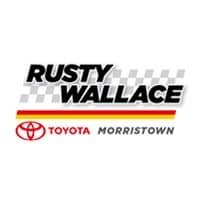 I bought my 2019 Camry from Rusty Wallace, and it was the best experience I could have had. Scott Winstead was amazing to work with, and he made it so easy to stay in contact and keep me updated. It didn’t take very long at all once I got there, and it was an easy in-and-out process. I definitely recommend Rusty Wallace and Scott as well! JD and the folks at Toyota was really helpful and made our buying experience simple.